Ruby/Sapphire MAGIKARP is virtually useless in battle as it can only splash around. As a result, it is considered to be weak. However, it is actually a very hardy POK�MON that can survive in any body of water no matter how polluted it is. Emerald Its swimming muscles are weak, so it is easily washed away by currents. In places where water pools, you can see many MAGIKARP deposited there by the flow. FireRed It is virtually worthless in terms of both power and speed. It is the most weak and pathetic POK�MON in the world. Leaf Green In the distant past, it was somewhat stronger than the horribly weak descendants that exist today. Diamond/Pearl It is unable to swim against even slow-moving currents. It always splashes about for some reason. Platinum A MAGIKARP living for many years can leap a mountain using Splash. The move remains useless, though. Heart Gold An underpowered, pathetic Pok�mon. It may jump high on rare occasions, but usually not more than seven feet. Soul Silver For no reason, it jumps and splashes about, making it easy for predators like PIDGEOTTO to catch it mid-jump. Black A Magikarp living for many years can leap a mountain using Splash. The move remains useless, though. 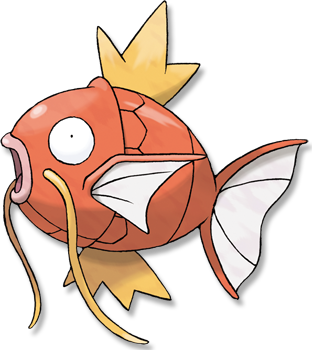 White A Magikarp living for many years can leap a mountain using Splash. The move remains useless, though.